Water channel normalization on Jl. 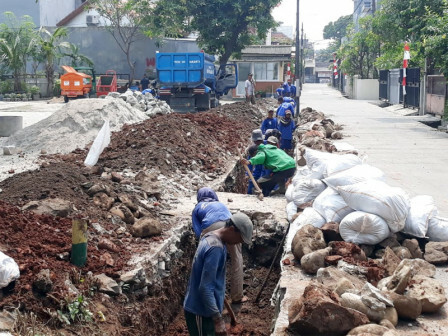 Melodi Mas 3, RW 20, Pegangsaan Dua Urban Village, Kelapa Gading, North Jakarta which has been started since August 3, now has progressed to 60 percent.
" It is done to anticipate inundation that could be happened later in the peak of rainy season"
Kelapa Gaading Sub-district Water Resources (SDA) Unit Head, Rukmana said, this normalization is targeted to complete on mid of this September. "It is done to anticipate inundation that could be happened later in the peak of rainy season," he mentioned, Monday (9/3). He explained, normalization is done on water channel's body that has covered by soil. Its length reaches 225 meters and channel's width is 0.6 meters and height is 0.6 meters. "Current progress has reached 60 percent. We hope it could finish on target," he said.